West Cornwall Recorder for the Botanical Society of Britain and Ireland and developer of ERICA. 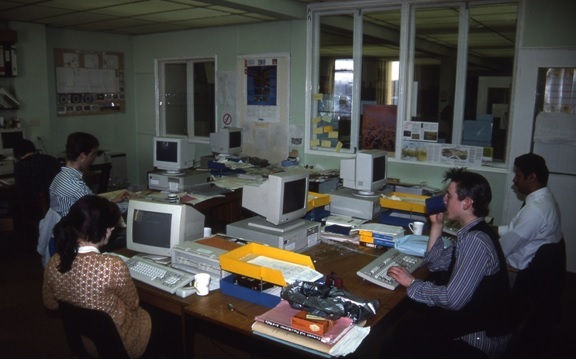 The ERICA database began life in 1987, when I was employed by the Cornish Biological Records Unit (CBRU), to computerise the records centre. 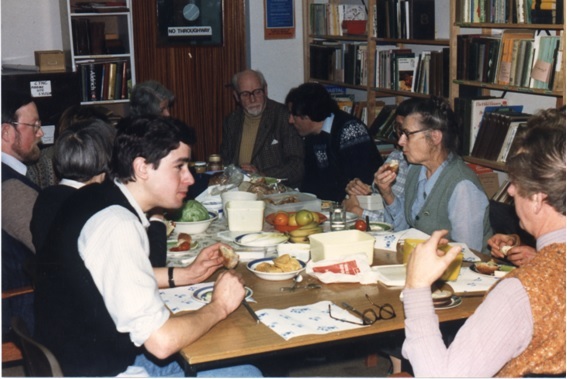 The CBRU was founded in 1972 by Dr Frank A. Turk, Reader in Natural History and Oriental Art, University of Exeter, to be part of the University's Institute of Cornish Studies, based at Trevenson House, Pool. Its aim was to record everything that lives, or has lived in Cornwall and the Isles of Scilly, on land and offshore. The CBRU was jointly funded by Exeter University and Cornwall County Council. Run by a part-time skeleton staff and very enthusiastic and extremely knowledgeable volunteers, the Unit amassed a vast paper databank of sightings of plants and animals, which were typed onto index cards. In 1978, for a few years, the CBRU moved to Murdoch House, Redruth, when Stella Turk became more involved in assisting her husband, Dr Turk. The Unit eventually moved back to Trevenson House and later the Trevithick Building on Cornwall College Campus. 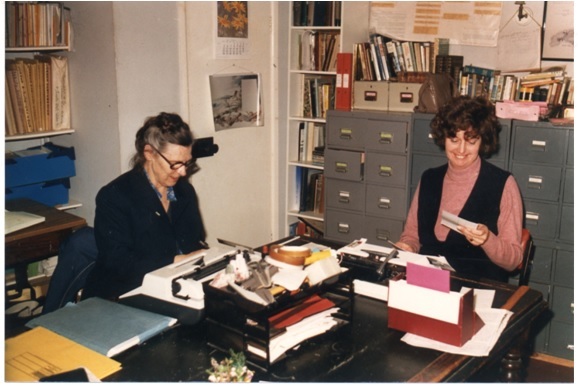 In 1980 Dr Turk retired and Stella Turk became CBRU Director, followed, circa 1993, by Adrian Spalding. The CBRU was both pioneering and very successful. By 1987 an estimated 250,000 records had been typed onto the card index, and as many records again, were to be found in the filing cabinets in partially extracted manuscripts, scientific papers, etc. I was employed by Exeter University to determine whether it was possible to computerise the CBRU and had to develop a prototype database. My remit was that everything that had been extracted had to go on computer. This was a time when the pc computer had just been invented, monitors were monochrome, 5 1/4 inch floppy disks stored just 360 KB and there was no internet. No other local records centre in Britain had a computer and whilst the National Records Centre, the Biological Records Centre at Monkswood, did have a computer, the records themselves were stored on punch cards and not held in the computer's memory. The idea that such a vast and complex dataset could be stored on a computer was pushing the boundaries. Meanwhile, the CBRU was bursting at the seams at Murdoch House and, with Redruth being the arson Capital of Cornwall, it became necessary to move the Records Unit. Swiftly, it moved in with the Institute of Cornish Studies at Trevenson House on the Cornwall College Campus. It was there that the initial database development took place. After 18 months of development a working database was ready for use. It was named ERICA which was short for Environmental Recording In Cornwall Automated. There followed a series of roadshows at which the ERICA database was demonstrated to garner support for the project and to build a momentum that would attract sponsorship. The project needed a mini computer to be viable and everything quickly fell into place when Prime Computers, a manufacturer of mini computers, gave one to the project. British Telecom was another major sponsor. Trevenson House proved to be unsuitable for such a computerisation project. 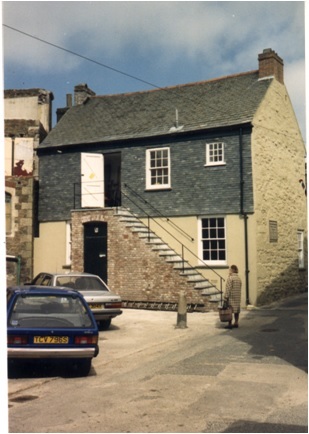 So the Institute of Cornish Studies and the CBRU moved to the other end of the Cornwall Campus to spacious, relatively modern premises, in the Trevithick Building. This historic building no longer exists and is now a McDonalds. It was originally the power station for the Camborne-Redruth Tramway and then became the HQ for the South Western Electricity Board (SWEB) before being taken over by Cornwall College. The new offices were excellent. A network of pc computers was set up in the computer room to act as terminals. These were connected to a fibre optic cable which had been laid across the Cornwall College campus to the Camborne School of Mines. From there there was a line of sight infrared link to the new SWEB HQ and from there the computer traffic was transmitted through the overhead power cables 100 miles to the Prime Mini computer at the University at Exeter. This was a high speed line operating 24 hours a day before the arrival of the internet. Computerising the CBRU now began in earnest. For six years, week in, week out, 3000 records were transcribed from the card indexes and manuscript sources onto the database. The CBRU also developed the very first Cornish website in Cornwall, populated with hundreds of web pages generated from the database, plus various reports and publications written by CBRU staff. As a result emails from all over the world were frequently received. The computer room manned by people on various Government schemes. CBRU staff, volunteers and a visitor. 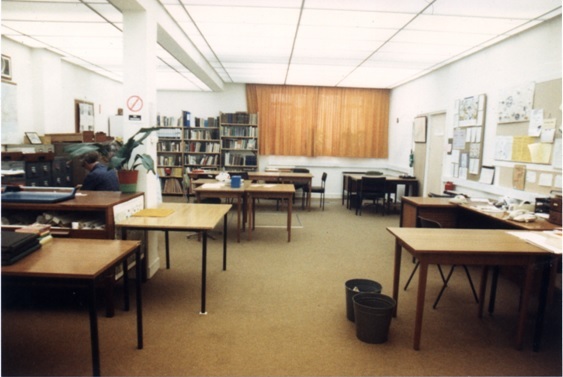 Such was the capacity for computerising biological records, it was soon realised that the CBRU could easily handle a much larger flow of fresh records. So the Botanists among us decided to systematically survey the whole of Cornwall to publish a Tetrad Atlas - a Flora of Cornwall in which Cornwall was divided up into 2x2 kilometre squares (tetrads), each of which was surveyed. This survey generated several hundred thousand fresh records. By the spring of 1996 the backlog of records on the card index system had been computerised and an important milestone was celebrated. 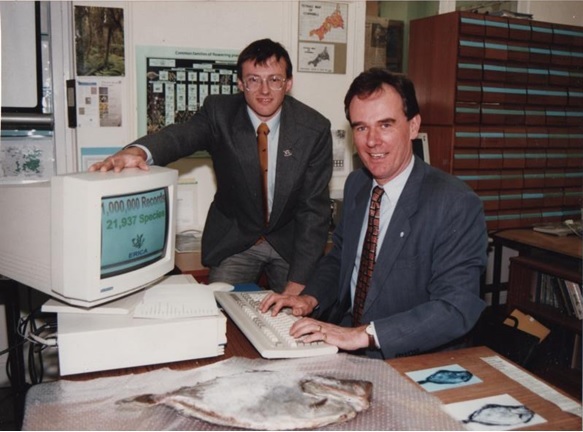 An event was held to mark the computerisation of the millionth biological record, at which Robin Teverson MEP entered the 1,000,000th record. It was chosen to be a Sailfin Dory (Zenopsis conchifer) which was caught off Looe on 29/09/1995. This fish was new to British waters and considered to be evidence of global warming. The actual fish can be seen on the desk in the photograph below. Such was the success of the ERICA Project, the CBRU had the largest online Natural History database in the world, and, through innovation, the database could be quizzed by the schools in Cornwall. Robin Teverson M.E.P. entering the millionth record. Six months after reaching its pinnacle the CBRU was shut down. The closure of the CBRU saw the complete break up of its assets. The staff and volunteers were cast asunder, the University kept the database, but it was fossilised, and the card index, paper files and library went to Cornwall Wildlife Trust (CWT). CWT set about creating ERCCIS as a replacement for the CBRU, but without the people that made the CBRU so vibrant, it was effectively still born, and it was years before it bore any resemblance to a Records Centre. The loss of the CBRU was a calamity for the local Recording Community. We no longer had access to our records, nor could we process, on computer, the fresh data we gathered. This tragic situation was particularly hard on the Botanists who were two-thirds the way through a systematic survey of Cornwall, which would now have to be abandoned. Thankfully, I was given permission by Exeter University to download all the records. 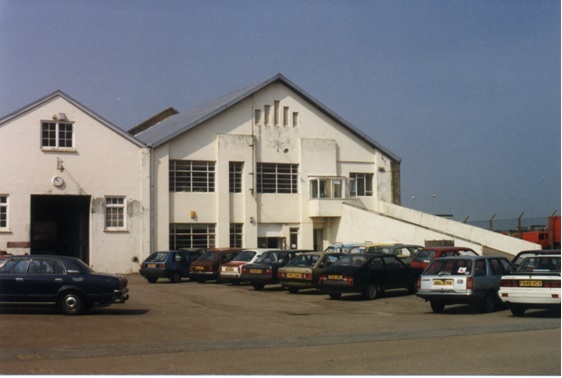 Despite no longer being in their employment, my login and password were kept alive by the Computer Unit, and the Camborne School of Mines provided me with a computer, a desk and a high speed link to the database on the mini computer. I then spent three weeks downloading the data. Such an amount of data could be downloaded in 10 minutes today. Once downloaded as text files, the database had to be re-built using the pc version of the Prime Information software. This was not a simple task as the pc database management system could not handle more than a third of a million records. So a mechanism had to be found which fooled it into thinking there were only 300,000 records when there were, in fact 1,078,000. This was successful. Next the index files had to be constructed from scratch. I borrowed laptop computer, wrote a program to generate the index files and set it running. The program ran 24 hours a day for three weeks and amazingly, when it completed its task, the index files were fully functional. Within 3 months of the closure of the CBRU, New ERICA had been born and the former CBRU staff and a few other recorders were operational again. Each person had a copy of the complete database on their own pc at home, into which they would add their own records and send a print-off of this data to the relevant VC Recorder for verification. Periodically, each person would send me a copy of the data they had entered, I would update the master database on my pc, and would send back a copy of the updated whole. In this way the local Recording Community was functional again, this time working from home as a Distributed Records Centre. There followed a strange time when members of the local Recording Community, working from home, had at their finger tips more biological records than anyone else in the world and were fully functional. This was in stark contrast to the newly created Local Records Centre, which was making little progress, and could only access the fossilised ERICA database on the Mini Computer via a dial up modem. The creation of the pc version of ERICA (NEW ERICA as it was known) meant that the various projects the recording community had been working on could resume. In particular the Botanists were able to finish their systematic survey of Cornwall and this was published in 1999 both as a book and a multimedia cd-rom (another first for Cornwall). During 2007 the ERICA database was completely re-written, as a multimedia Windows database, using Microsoft Access as the filing cabinet. It was now much more powerful, more sophisticated and easier to use, and consequently was adopted by a wider range of biological recorders in Cornwall. The launch of ERICA for Windows saw an immediate and dramatic rise in the number of records being processed. Since 2007 ERICA for Windows has grown at a rate of 200,000 records per year and over 5000 new species have been added to the Cornish list. 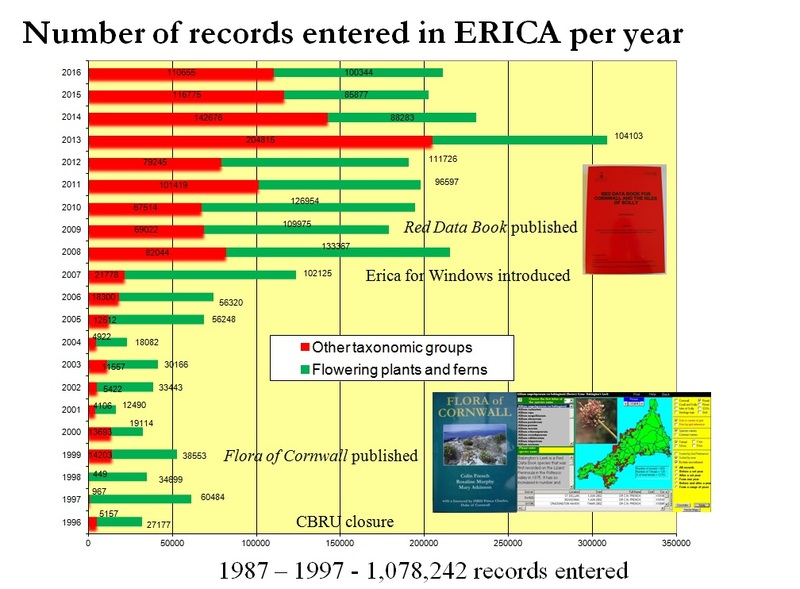 Erica for Windows was also the main resource used in the writing of the Cornish Red Data Book, which was published in 2009. Erica for Windows has now been re-written to run on MySQL, PostgresSQL and Microsoft Server networks and is installed on the Cornwall College Intranet for the use of students and staff at Newquay College as well as online for the Cornish Biodiversity Network.